The performance of precision, multi-axis positioning solutions for laser processing depends both on the mechanics and the drive type selected, and also its automation controller. To achieve consistent path quality during laser cutting, the intensity of the laser and the speed of the moving components must be precisely matched to each other in order to cut as consistently as possible and in the shortest possible time. In conjunction with high performance controllers and intelligent algorithms, precision positioning systems now fulfil the requirements that enable laser processing to achieve high accuracy and at the same time, high throughput. A system that provides consistent contouring that is independent of the profile pattern is an important feature for laser users. However, this cannot always be guaranteed in the case of challenging tasks such as laser marking, cutting, welding and laser engraving, particularly when high throughput is required at the same time. Many laser processing systems are based on motion control that positions the laser while it is operating with constant power and pulse repetition rate. In this case, the cutting quality is dependent on the motion. 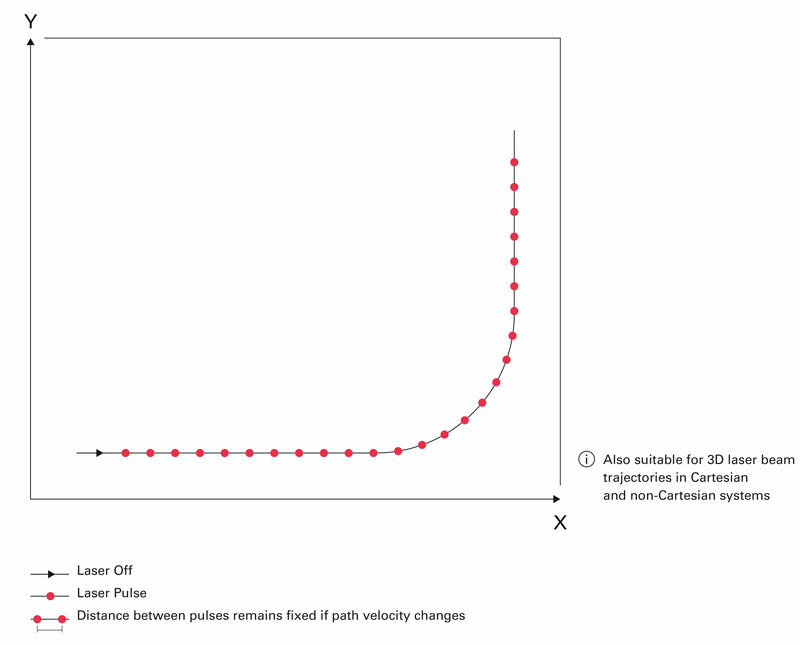 When cutting an edge for example, it may then be necessary to reduce the speed of the laser in relation to the work piece in order to avoid high axis acceleration during changes in direction. The process therefore takes longer and the throughput decreases. However, there are additional disadvantages: The depth and width of the cutting contour changes and the processing quality suffers as a result. Synchronising the pulse repetition rate and the intensity of the laser with the motion is a much more practical solution however this makes additional requirements on the automation controller and the positioning system (image 1). 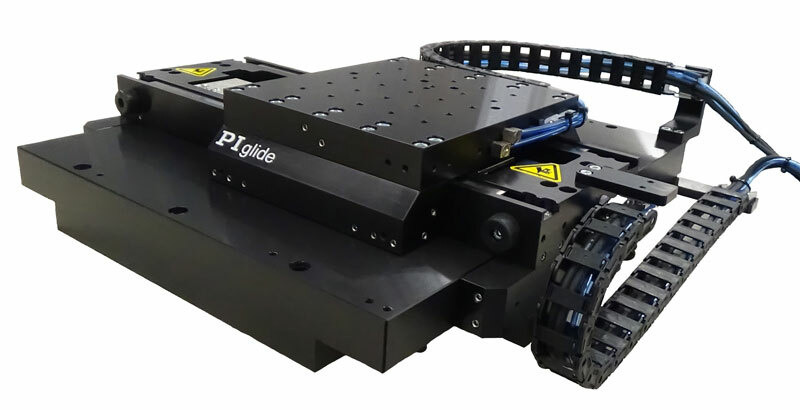 As a solution supplier for drive technology and positioning systems, PI (Physik Instrumente) has accepted this challenge. 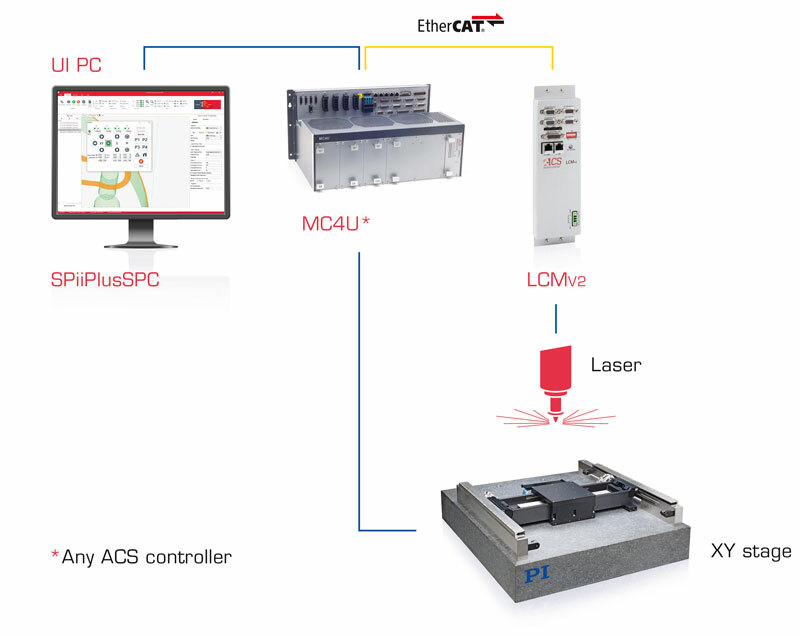 Together with the controller platform company ‘ACS Motion Control’, PI can provide single-source automation solutions for the industrial laser market that allow both high quality, and high throughput rates. The ACS motion controllers provide high precision positioning systems motion but now support both position- and speed-dependent laser triggering and analogue control. Therefore, motion and laser pulses can be matched to each other with high determinism for cutting edges, arcs, or high complex patterns. The consistent distant firing of the laser along a path and its power control, determine the quality of the cutting line. An optimised algorithm in the controller synchronises the motion of the work piece with the laser pulses so that the pulse size and the gap between adjacent points remain consistent even while cutting features like arcs (image 2), and circles. The algorithm avoids inaccuracies that are caused by possible fluctuations in the motion behaviour when moving along lines that are not straight. Cutting are therefore no longer dependent on motion parameters. 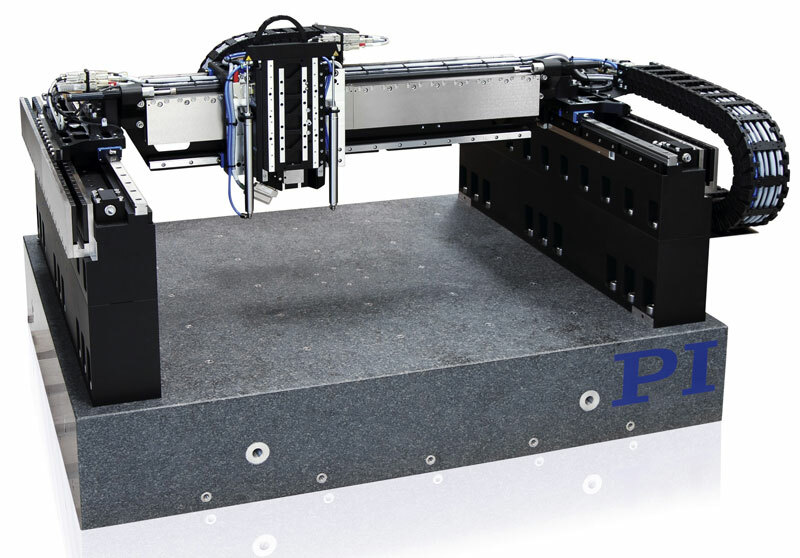 The gantry systems (image 3) with a high stiffness but lightweight motion platform offer high throughput with low levels of resonance. Optimised cable and services management allows the addition of a vertical stage, autofocusing sensors and a laser delivery system. The design permits the part to be stationary and the laser head and optics to be moved above. The preference of PI for the use of dual absolute encoders avoids the requirement of homing on start-up which may cause binding and eases system initialisation. The low profile A-311 series (image 4), is a dynamic air bearing platform XY stage again boasting again great flatness over a travel range of 200x200mm with a repeatability of ±0.05µm. Its compact design provides users with great space utilisation in their machine design. It is driven by an ironless magnetic direct drive that enables high acceleration and velocities with smooth motion. 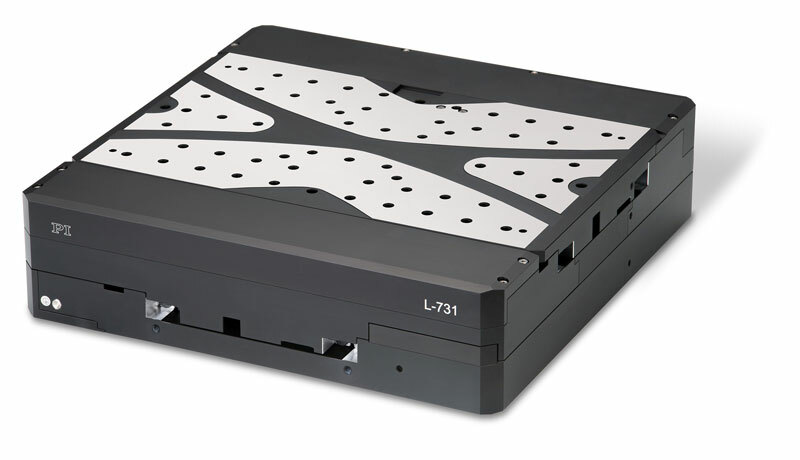 Also well suited to laser cutting is the high precision XY stage V-731 (image 5). The unidirectional repeatability is 0.1µm and minimum incremental motion is 0.02µm. 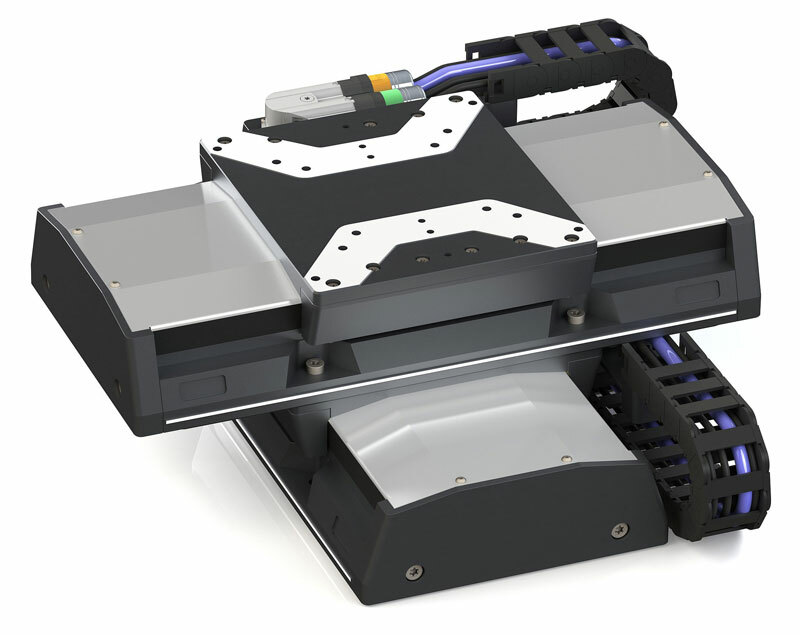 The three-phase linear motors dispense with mechanical components in the drivetrain and transfer the drive force directly to the motion platform without any friction. This means that high velocities are possible. For high velocities, high accelerations, and loads up to 1,000N PI offers a new series of high-load linear stages, which can also be easily mounted to XY set-ups (Image 6). Excellent results were achieved in laser micro processing by a control module specially developed by ACS for this application field. It allows direct control of the laser source in order to increase the precision and throughput. The EtherCAT slave module of the LCMv2 series offers a broad range of functions, including digital pulse modulation for dynamic power control, output pulses or gating signals (on/off) that are synchronised to positions along a two to six-dimensional motion path or programmable operation zones. The control module can control virtually any laser via universal electrical interfaces. In addition to the high speed laser signal output, the module is also equipped with a special safety lock system, an error input, and an enable output. Eight digital I/Os are also available for laser specific functions. Solutions consisting of positioning system, automation controller, and laser module are being selected by the world leading Laser integrators, end users and research institutes. When cutting complex paths, the solution has shown that a high performance motion system, where motion and laser pulses are synchronised, can lead to high quality laser cutting results.